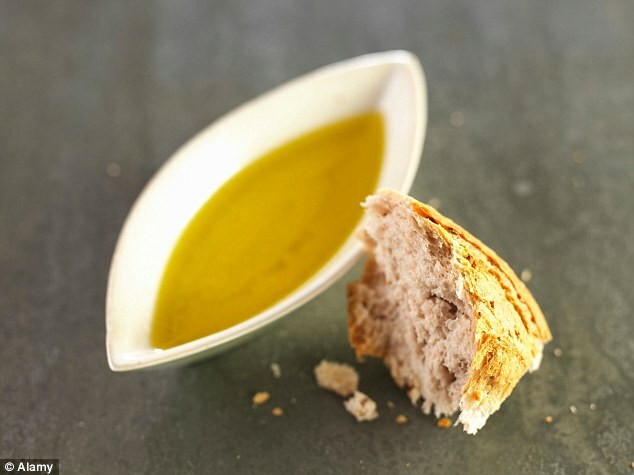 The EFSA approval says the scientific evidence supports the consumption of olive oil because its ‘polyphenols contributes to the protection of blood lipids from oxidative damage’. EFSA says in order to get the protective effect, 5mg of hydroxytyrosol and its derivatives including oleuropein complex should be consumed daily. Although these amounts can be easily consumed in a balanced diet, EFSA says ‘the concentrations in some olive oils may be too low’ to reach the target. Nutritionist Dr Emma Derbyshire said ‘The mass of evidence demonstrates these olive polyphenols have a powerful antioxidant effect. ‘We’ve known about the health benefits of olive oil for a long time, and there is evidence of traditional use of olive leaf for healing, but this review confirms the importance of hydroxytyrosol and oleuropein.’ ‘I think this is definitely a case of watch this space.’ she added. ‘These antioxidants appear to have a very broad activity so it’s likely that further research will confirm even more health benefits.’ She said the new product could provide twice the daily dose backed by EFSA in a form that was easily digestible. 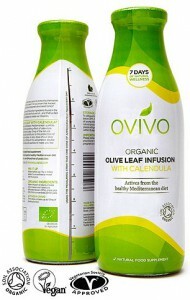 ‘Ovivo Organic Olive Leaf Infusion is virtually fat free, has no added sugar and is created as an infusion of spring water, which means it mixes easily with juices, smoothies and herbal tea and is suitable for those who avoid alcohol’ she said. The drink is available in Boots, Holland & Barrett and other health stores at £13.99 for a bottle containing seven servings, with one serving recommended a day. This entry was posted in Banavas Estate, Chalkidiki Olives, Drinks, green olive products, Health-Nutrition, Inolivia olives and tagged Chalkidiki Green Olives, Chalkidiki Olives, health, Inolivia Rich Olive Flavours, nutrition facts, olive leaf benefits, olive leaves. Bookmark the permalink.